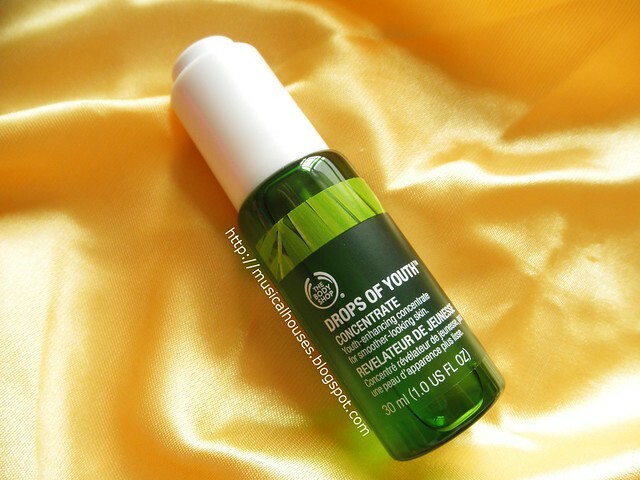 The Body Shop's Drops of Youth Concentrate is a new skincare product, and according to The Body Shop's website, it "works to help boost surface skin cell renewal", so that your "skin feels immediately moisturized and instantly softer". 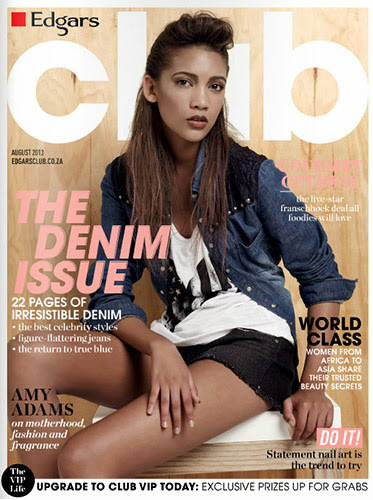 For those who like such products, it also claims to be silicone-free and paraben-free, with "99% natural ingredients". With such a description, I was very curious to check it out and see exactly how it works! 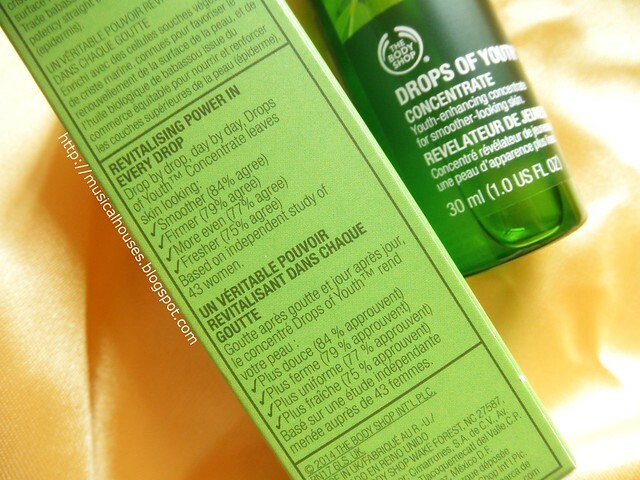 I mean, even the packaging has a whole list of awesome things the Drops of Youth Concentrate does - smoother skin, firmer skin, more even skin, fresher skin. What more could a girl want, right? With that in mind, I decided to take a look at the product's ingredients list first, in order to really get a sense of how it works, and whether it lives up to its hype. The ingredients for the product are Water, Alcohol Denat., humectants (Glycerin, Propanediol, Sodium Hyaluronate), Chondrus Crispus Powder, Benzyl Alcohol, which is both a fragrance and preservative, Fagus Sylvatica Bud Extract, Aloe Barbadensis Leaf Juice, and Adenosine. After this, we have the Fragrance ingredient, which is usually present in small amounts, so everything after that is probably also present in small amounts. This includes the rest of the plant extracts and oils, some of which have various benefits to skin, such as performing emollient functions, or (Crithmum Maritimum Callus Culture Filtrate, Orbignya Oleifera Seed Oil, Buddleja Davidii Extract), as well as various citrus extracts (Linalool, Limonene, Citronellol) which smell nice but may be a bit more dubious in terms of skincare benefits, so it's just as well that the citrus extracts are there all the way at the end. The interesting thing here is the Chondrus Crispus Powder - this is fourth in the ingredients list, and one of the more predominant plant-based ingredients. Chondrus Crispus is a kind of red seaweed, and it is believed to be useful in skincare, because it is "rich in bioactive compounds, such as proteins, peptides, amino acids, lipids, fibers, pigments, polyphenols, and polysaccharides" which may impart skincare benefits, as an antioxidant. It also has film-forming and emollient benefits, and can function as a thickener as well. So in terms of plant extracts, this seems to be providing the most benefit. There is also Fagus Sylvatica Bud Extract, which I couldn't find any published studies on, but is claimed by a manufacturer to have "minimize wrinkle appearance and guarantee optimized skin moisturization". There's also Aloe Barbadensis Leaf Juice and Adenosine, both of which have anti-inflammatory effects. There is also some indication that Adenosine may have other beneficial skincare effects, like aiding in wound healing, so that may help in terms of maintaining the skin's condition. One thing worth mentioning is that there don't seem to be many other products using Chondrus Crispus Powder either, or a combination of similar ingredients (as opposed to say, something like shea butter, which is much more easily available). 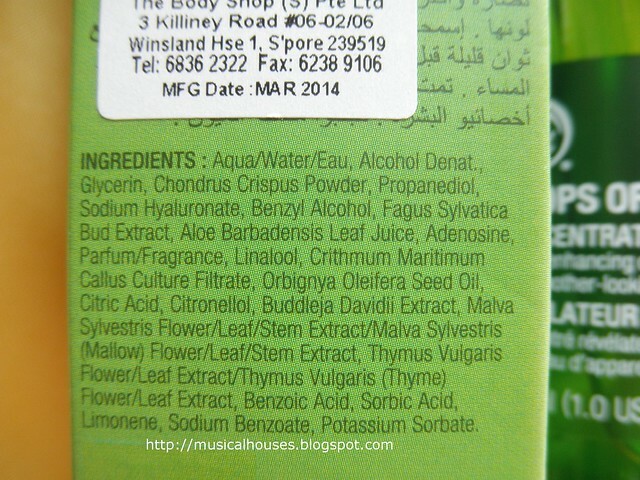 If you're in the market looking for a serum-like product with some fairly novel, unique plant ingredients, this may appeal to you. Some people may also be concerned with the alcohol content in the product. While I've written before on the blog that alcohol itself isn't a total dealbreaker for me, depending on the overall formulation of the product and the function of alcohol in the formulation. In this case, my best guess is that the alcohol is there to act as a penetration enhancer, that helps the product (and subsequent products) applied absorb better into the skin. But since the rest of the product isn't formulated to be very emollient or occlusive, and since alcohol is the second ingredient in the ingredients list, I do think the percentage of alcohol could warrant some concern among people with skins that are particularly sensitive or dry. If you fall into that group, it may be a good idea to patch test first. So overall, the Drops of Youth Concentrate is formulated to be a lightweight, fast-absorbing water-like product, possibly with anti-oxidant, anti-inflammatory, and other benefits, such as sound-healing. When I tried out the product, I found that it had a strong floral-citrus scent, which I attribute to the Benzyl Alcohol (which imparts a floral scent at high concentrations), as well as the citrus extracts (Linalool, Limonene, Citronellol), in addition to the perfume. However, the scent dissipates fast and doesn't linger for too long. Scent aside, the Drops of Youth Concentrate is indeed a lightweight, fast-absorbing product. 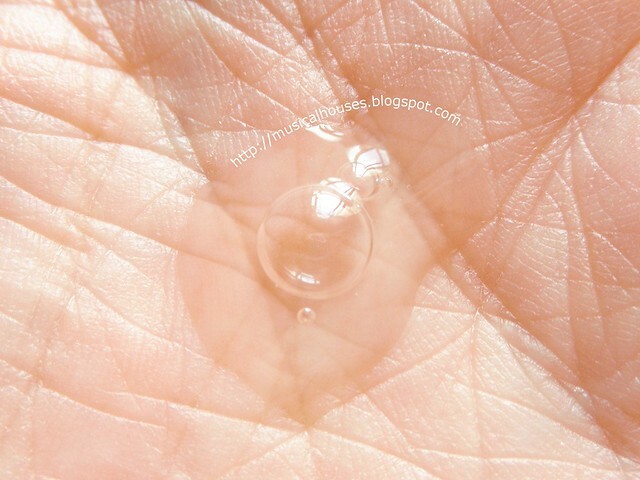 It has a light gel texture that sinks into skin immediately, and leaves no residue on the surface. And despite the alcohol content, I didn't find this particularly drying (maybe an indication that it isn't there in a huge percentage? 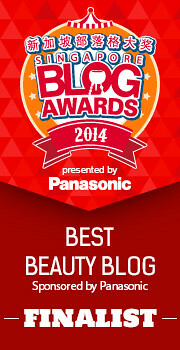 ), although I imagine this is best worn under another moisturizer if you live in a dry climate. I did find that my skin appeared to be better overall with use of the product, although it was hard for me to pinpoint a specific improvement. So, would I recomend this product? Overall, it seems to be decently formulated - there are some concerns with the alcohol in the product, but at the same time, the product seems to be formulated to have some skincare benefits, such as anti-oxidant and anti-inflammatory benefits, too, and it uses some fairly unique plant ingredients. 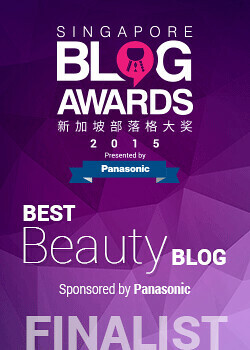 The texture is also lightweight and absorbs quickly, making it easy to use under any other skincare product. And I also like the sensible dropper packaging, which is hygienic and fuss-free. At S$59.90, it's a bit more expensive than your average drugstore brand, but yet it's not as pricey as the really high-end brands. 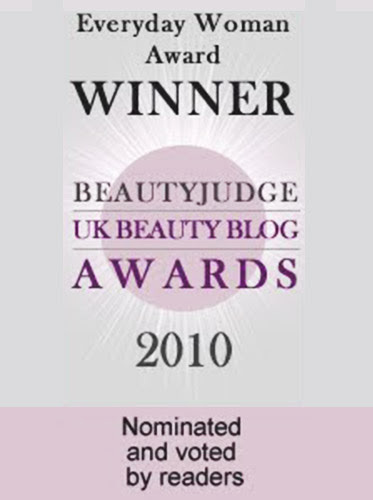 I think if you're in the market for a serum that incorporates some useful and unique plant-based extracts, yet is aesthetically pleasing to use, and if you don't have particularly dry or sensitive skin, this might be worth checking out. 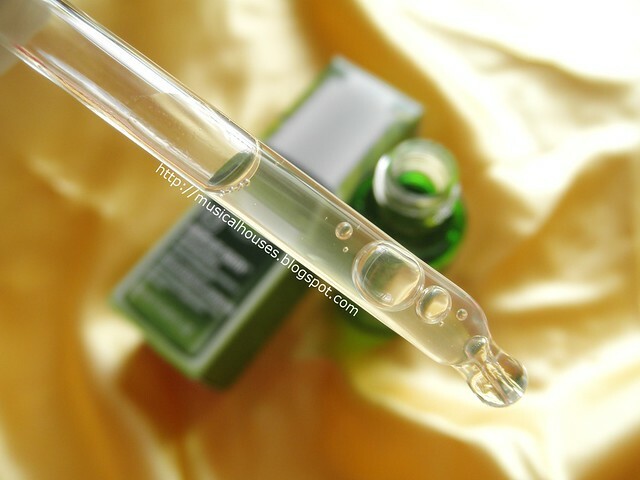 The Bottom Line: The Body Shop's Drops of Youth Concentrate is a lightweight serum-type product that seems to have a fair amount of alcohol in the product, but that aside, it also has anti-oxidant, anti-inflammatory, and other skincare benefits. Looks interesting. How long did you use it for? So I've probably been using it for a month or so. Hope this answers your question! I've been using this serum for a month. What i can say is that it make my skin better in term of clarity and also less oily on T-zone and more plump on my cheeks area( i have combo oily skin: oily on T-zone and dry on around cheeks area). Another thing i like is that it is fast absorbing into skin once applied. Does not leave any trace of film or feel stickiness after applying on my skin as i hate product that sit on my skin instead of absorbing into skin. 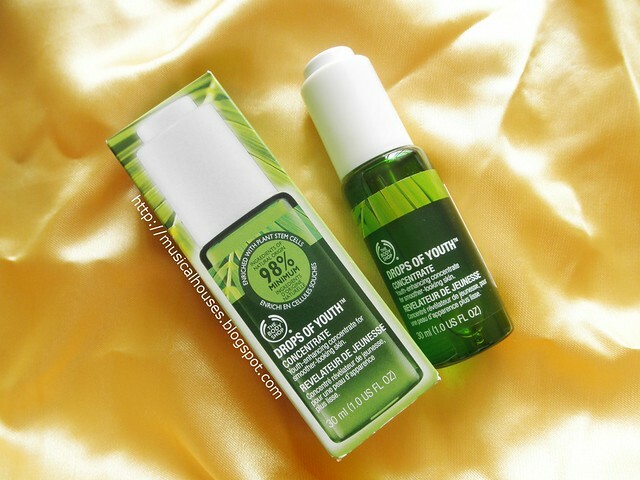 Overall im quite impress with the The Body shop skincare product which i always overlook them or never want to try them because normally i will just pass them coz i always think Body shop only good in body product and not on skincare product. I give 9/10. Another product that i also just purchased from BS is their new Vitamin C moisturizer which come in a jar (how much i hate these day big company still make their product into jar instead of pump application for hygienic purposes). The vitamin C moisturizer is gel like texture, fast absorbing. Pairing these 2 product make me realise my skin glowing as if there is a bulb light inside my face every morning when i wake up. Really amaze by it. Is this product good for sensitive skin? @Unknown: The alcohol would be the main concern, and a secondary concern would be the citrus extracts (which are there in small amounts). If you don't have alcohol sensitivity, or don't have particularly dry skin, this product should probably be fine. Stuff I've Used Up: Lots of Empties and Pans!